If you’re reading this, then chances are you’re conducting research about installing an in-ground swimming pool. 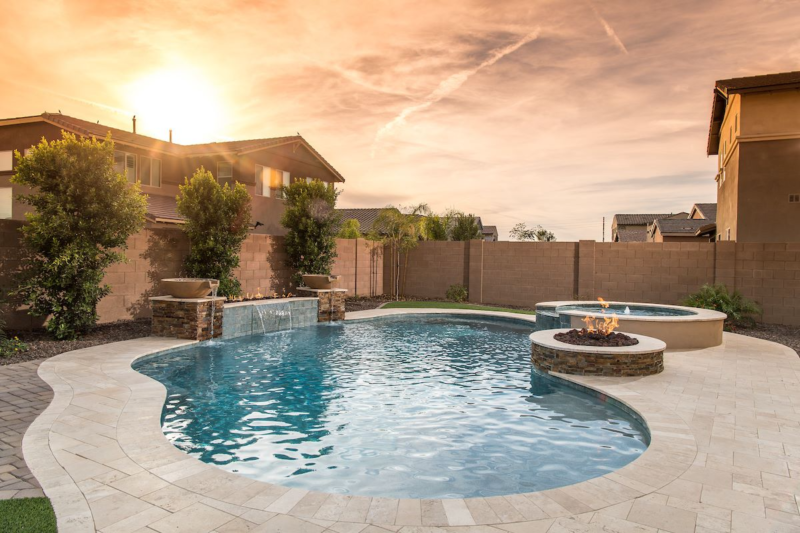 Below is a handy list of basic pool construction terms you are likely to encounter as you search for the perfect pool builder to create your dream swimming pool. We hope it makes doing your research that much easier and helps you make an informed decision. A pool cleaning system that removes debris from a pool’s interior automatically. Refilling soil around a completed in-ground pool shell. Cleaning the pool filter by reversing the flow of water through it. The top, horizontal portion along the perimeter of an in-ground pool that is reinforced to resist horizontal forces on the pool. The number of gallons of water a pool holds. A water pump consisting of an impeller that creates the pressure to pump pool water with centrifugal force. Chemical(s) used as a disinfectant in pool water to kill or control bacteria and algae. The top lip on a pool wall that provides a finished edge around the pool’s perimeter. Diatomaceous earth. A porous substance used in some pool filters. The area immediately around a pool typically constructed of masonry or wood. Any area of the pool in which the water depth exceeds 5 feet. A fitting installed on the suction side of the pump in a pool and located in the deepest part of the pool. The drain directs water to the pump for filtration and circulation. A device that removes particles from pool water by recirculating the water through a porous element. The three types of pool filters are: sand, cartridge, and D.E. (diatomaceous earth). A cover that lies of the surface of the pool as opposed to a hardtop pool cover, which rests on the coping. A floatation cover is mostly only effective at keeping debris from getting into the pool water. A type of concrete used to anchor rebar within pool walls, connect sections of masonry (as in a concrete deck), seal joints, and fill spaces. Grout is usually composed of a mixture of water, cement, and sand, which is applied as a thick liquid and hardens over time. A pneumatically applied concrete mixture of cement and sand sprayed onto contoured and supported surfaces to construct pool walls. As opposed to shotcrete, gunite is mixed and pumped dry, and water is added as the gunite exits the applicator (a hose). Plaster is usually applied over the gunite. An overflow trough at the edge of a pool used to remove debris from surface water. Pools with gutters usually do not have skimmers. A cover used on pools whose edges rest on the coping of the pool or deck (as opposed to a flotation cover that sits on the surface of the water). The pool cover functions as a barrier to swimmers and debris and helps control pool temperature. A device used to heat the water of a pool or hot tub. A rubbery sealing compound used by a pool builder to waterproof joints in pool coping. Think of it as caulking for your pool. The system in a pool that removes excess surface water. A type of material commonly used by pool builders as an interior finish applied over the concrete walls of an in-ground pool. A mechanical device, usually powered by a motor, which is used to move water to a filtration system or to be heated and circulated. Polyvinyl chloride, which is the plastic material used to make the PVC pipe used in pool plumbing. Reinforcing bar. Steel bars used to add support to concrete or other masonry. In pool construction, a steel “cage” is built out of rebar, and the gunite or shotcrete is sprayed over and around it to form the pool shell. A pneumatically applied concrete mixture of cement, sand, and water sprayed onto contoured and supported surfaces to construct pool walls. As opposed to gunite, shotcrete is mixed and pumped wet. A pool cleaning device installed in the wall of a pool that is connected to the pump. It draws in water and debris and skims off large debris from the water on its way to the filter. The removable basket or strainer part of the skimmer that traps floating debris. A pool cover that increases pool water temperature by absorbing and transferring heat from the sun. A light fixture that illuminates the pool under the surface. A device that regulates the flow of water into a skimmer. In the event your pool builder mentions a term not listed here, don’t be shy about asking for an explanation — a reputable company will want to make sure you understand every step of the process and will be happy to answer your questions along the way.